Emotional Knowing & Removing Barriers. How will you do so this week? Merry Christmas and Happy Holidays Everyone! As our last week of 2018 is freed up of any inner planet retrograde shadow, we now gather up our 2019 momentum, sitting with our reflective knowing from the past year. If we have honored our individual healing, the light in our NOW is ours to OWN in the New Year. Empowerscopes align you with the power of astrology to give you peace of mind for our changing times so you can begin to hold your keys to success. Listen for your Sun Sign to receive this week's focus guided by your current astrology forecast. Should you have already had your natal chart cast by a professional astrologer, equally listen for your Ascendant/Rising as well for an even more personalized view. Astrology’s Terrific Timing Is Everything Tips Help YOU Plan for Success! What’s naturally beginning or concluding in your life? LunarOScopes relate from the most recent New or Full Moon, whether naturally focusing upon initiations or release is favored, as our Moon journeys through its’ monthly waxing and waning phases. Follow the Moon's movement all week long and optimize your current timing and planning needs. When we understand how lunar cycles affect our emotional state of mind, we are able to utilize our feelings as powerful messengers to reap rewards verses struggling inefficiently against them. 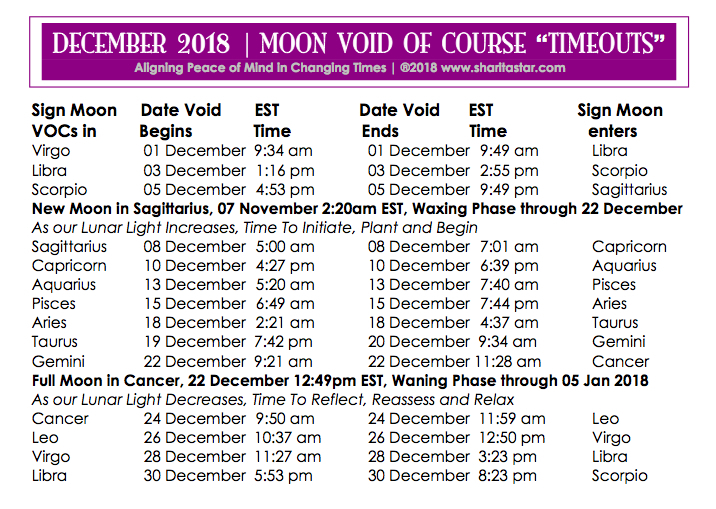 Moon Void of Courses (M VOC) are a marvelous astrological timing tool precisely pointing to favored periodic “timeouts” in life that occur throughout any given work week. All Moon VOC passages specifically advise against scheduling any initiations, important meetings or even making purchases of any kind intended for long-term success: otherwise “nothing becomes of it.” Follow this critical astrological “rule” to stop wasting time and become more efficient and mindful. Hours are for EST. The current request to realign and iron out the retrograde fabric details after a cycle of reflection. Mercury Retrograde just asked us to consciously take time to reflect, review and renew, and be just a bit more mindful about decisions for our future. Mercury is our planet who guides over our thinking, mentality, communications, and movement of any kind involving transportation or information. During his third and final Retrograde cycle of 2018 within Sagittarius/Scorpio, his backtracking through the Zodiac created those natural interruptions, rerouting and flux within our schedules- where having our back-up plans ready to go were always recommended as we anticipated change and sat in the space of review, release and redo from 16 November to 06 December. Join Sharita & Discover How You Can Be Mastering Mercury Retrograde in 2019! Astrologer, Numerologist & Author Sharita Star's mission guides and supports people and businesses from all over the world in translating the tools of Astrology, Numerology and Lexigrams into a simple, yet powerful life map for achieving success. As a Radio Personality she produced 'What's Your Sign? I Have Your Number!' on WBCR-LP from 2009 to 2013. and on the HeyZRadio Network from 2014 to 2015. Equally, Sharita has been a celebrated guest on countless hours of TV and live radio since 2007, in where her sought after on the spot readings entice any listening audience on local, cable, internet, CBS, ABC and PBS stations. Mastering Mercury Retrograde is Sharita’s innovative program that enlightens students with powerful awareness tools creating a shift from the typical fears and misinformation surrounding “MRx” passages. It's All in theName is Sharita's first book about the topic of lexigrams, which invites us all to learn how we can spell out the truth from our words, names and titles. Currently Sharita is a Platinum Ezine Author, a regular columnist for Astro.com, Bellesprit Magazine, Hudson Arts Magazine and was most recently featured in Fitness Magazine. Her new Astrology & Numerology Wheel application is now available on iTunes. Start opening the door to how your name and birthday hold the keys to your success at sharitastar.com.